Since 2007, Earth Hour has helped bring climate action from conference rooms to living rooms. Now is the time to do the same for nature and biodiversity, which underpin the well-being and sustainable future of people everywhere on earth. What is the focus for Earth Hour 2018? For Earth Hour 2018-2020, WWF’s objective is to help achieve the Convention on Biological Diversity’s (CBD) Aichi Biodiversity Target 1, so that hundreds of millions of people understand the values of biodiversity and the current critical condition of our planet. Better informed and aware, they can take actions to protect biodiversity and nature, live more sustainably and expect the same of businesses and their governments. We aim to drive awareness, conversations and actions in the public and media about the importance of nature and biodiversity (and the danger of its loss) – in preparation of the Super Year 2020 when some of the world’s most important policy instruments for sustainable development - the Paris Agreement, SDGs and CBD - will converge and influence policy makers to make the right decisions to ‘bend the curve’ on the ongoing decline of biodiversity for 2020-2030. Earth Hour 2018 is just the beginning. We want to use the ‘moment’ of Earth Hour to kickstart the conversation and engage hundreds of millions of people worldwide to take action through 2018-2020 and beyond. Through the movement and its mainstream appeal, we want to communicate to people the interconnectivity of climate change with biodiversity and people. Biodiversity with its three components - species diversity, ecosystem diversity, genetic diversity - is essential to the food we eat, to the water we drink and the air we breathe and yet, at present, the concept of ‘biodiversity’ is not widely understood. Like global warming in the past, the concept of biodiversity seems unrelatable, distant and abstract and, as a result, its economic, social and environmental importance is often poorly undermined. This needs to change. The Convention on Biological Diversity (CBD) has set the target that by 2020, at the latest, people should be aware of the values of biodiversity and the steps they can take to conserve and use it sustainably. Earth Hour 2018 will therefore be the kick-off event to scale up communication on biodiversity and nature. In this first year, we will raise awareness about the links of biodiversity and climate action. Earth Hour 2018 will spark open social conversations about that interconnectivity. Adopting a data-led approach, we will drive people to the connect2earth.org platform to capture global conversations around biodiversity and nature as well as on the links to climate change. The connect2earth.org platform will therefore allow us through search and social data to understand the current levels of conversation on biodiversity globally. This data will then help inform how we drive communication further on the importance of biodiversity and the danger of its loss up to 2020 to influence policy makers going forward. Subsequently, in 2019 and 2020, Earth Hour will focus on getting people to take action to reverse the trend of biodiversity decline. While a better understanding of the values of biodiversity is important in building the motivation for action, it is not enough. Individuals also need to be aware of the types of actions they themselves can take and be enabled to take these steps in order to conserve and sustainably use biodiversity. As the world’s largest grassroots environmental movement, Earth Hour played a key role in inspiring millions to take climate action, and this is exactly the kind of momentum we need to generate today around the importance of biodiversity and nature. Mangrove forests serve as a transition between marine and terrestrial environments, providing critical protection from the impacts of climate change including absorbing wave energy and storm surges, adapting to rising sea levels and stabilizing shorelines from erosion. These mangrove forests also sequester and store atmospheric carbon at a rate much higher than any other type of forests, and thus play an important role in climate change mitigation. Fiji’s mangrove areas are the third largest in the Pacific behind Papua New Guinea and the Solomon Islands, with approximately 42,600 ha2 mangrove forest with the largest stands found in Viti Levu and Vanua Levu. EH2018 will see the Fiji office hosting an event with the Lami Town Council. 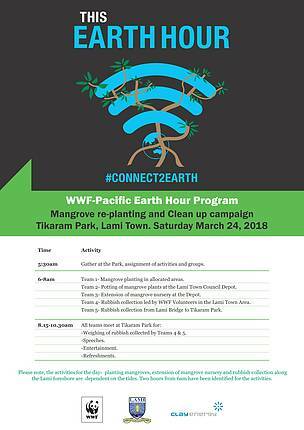 WWF staff will be jpined by partners and volunteers to participate in activities that include planting of mangroves in allocated areas in Lami, extension of the Council's mangrove nursery, potting of mangrove seedlings and a clean up along the Queen's Highway from the Lami Bridge (Delainavesi end) and in the town area. The day will also be a chance for WWF and partners to create awareness on the importance of the magrove ecosystem . Earth Hour 2017 will take place on Saturday 24th of March from 8:30 PM - 9.30pm. So lock the date and keep coming back to find out what’s in store and how you can get involved.